Longtime indie Team 17 does what it does by gracing our new consoles with their first 'Worms' title, 'Worms Battlegrounds.' Coming off a game engine switch from the last installment, 'Worms Battlegrounds' has been billed as the biggest and best 'Worms' to date, which is a tall order. The series has long continued to get players embroiled in a conflict of artillery and troops of worms, and the ascension of online multiplayer gaming in the console space has meant more players discovering the PC staple of addictive online strategy. 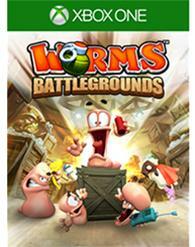 This 'Worms' title even has a camapign. Now it's time to fire up a new console and see how the turn-based combat, physics, weapons, and multiplayer all shake out. The online arena is major feature, and it's where clans of up to eight players can accrue points over seasons of ranked play, striving to climb ladders and jump divisions. 'Worms' is one of those franchises that, once infected into a gamer's preferences, remains steady so long as there's somebody else to play against. It's more akin to a good board game than those virtual stories we often refer to as the best of video games; it's a mainstay, and Team 17 knows it. They've thrived, suffered and somehow continued on the back of battling bugs throughout the years, so rarely changing in a significant way, yet so rarely needing to. 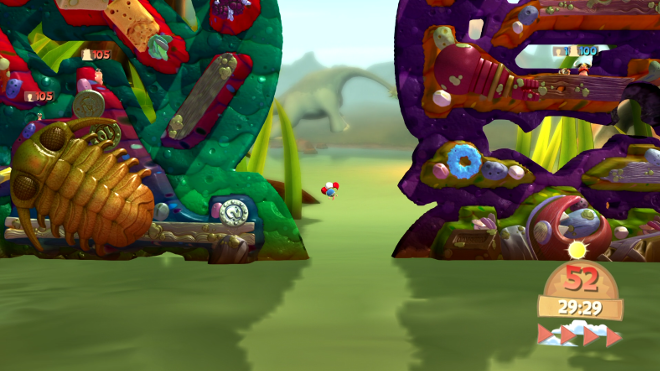 Still, in 2012 'Worms Revolution' attempted a few significant upgrades, throwing slip-sliding water physics and worm classes into the mix, and for many 'Worms' fans it was a welcome enhancement, enforcing new strategies and thus new experiences. 'Worms Battlegrounds,' the first of the franchise on Xbox One and PS4, continues in the same vain as 'Worms Revolution,' but feels markedly less revolutionary as a result. We're back, it seems, to subtly changed repeats of the same thing. As usual, the core objective remains exactly the same. Teams of four or so worms are spread across a two-dimensional, destructible landscape, tasked with blowing eachother up, turn-by-turn, worm-by-worm, using an amusing and satisfying arsenal of grenades, bazookas, shotguns, airstrikes and explosive sheep, grandmas and bulls. Those are but a few of the wacky, lethal weapons. As usual, the simple joy of exploding an enemy worm remains exactly the same. Like 'Revolution,' water plays a large part in the arsenal now. Using water bombs, guns and airstrikes to slip an enemy over a cliff and into the larger, immediately fatal ocean on either side of a stage is only the beginning. Slowly drowning worms in a hole of their own making or guiding explosive mines into a collision course are part of the nuance employed by the slightly more experienced players, and it becomes clear that adding water was just about the most brilliant thing Team 17 has done since the franchise's inception. It holds as an interesting tactical element – the most interesting, in fact – which counts both for and against the new title. The truly new additions, the things that set 'Battlegrounds' apart from 'Revolutions,' aren't so deserving of high praise. Take the single-player campaign as an example. Somehow, in spite of everyone, Team 17 has held on to the idea that a 'Worms' campaign is a good idea as anything other than a tutorial. Annoying, barely comical narration over-explains a needless story, sends you on a collection of missions that throw out the basic ideas of turn-based combat, instead opting for puzzle-like scenarios with exactly one solution. Inch your worm over here, blow this guy up, jump over this gap, ninja rope up that cavern. The exacting nature of the solutions renders these scenarios an absolute waste of time, and then completely monotonous as the deadpan narrator strains for humor. Along side the campaign are Worm Ops missions, which lazily utilize the same overworld map as the campaign, yet finally edges back into tutorial territory. Thankfully, everything else about the game is multiplayer-focused, as it should be. 'Battlegrounds' allows players to clan up and earn points through ranked matches for a cumulative total. Clans are broken up into divisions, and it's your job to get to the top and move on to silver or gold. While nothing about this system changes the fundamentals of the game, the opportunity to find allies in what is usually a pretty antagonistic experience definitely brightens the mood, and so far it seems the community has taken to it. There is a problem with the online infrastructure though. The net code is serviceable, as it only needs to be for a turn-based title, but the actual modes on offer needlessly compete with each other in a way that makes it impossible to find certain kinds of games, namely (my favorite), Forts. The bottom line is Team 17 built in way too many ways to get into a match – ranked play, player matches, both of which house forts and deathmatch, and battlegrounds ranked and battlegrounds player matches all get you to the same kind of match, so you've got a community of players split on how they approach their own community. Ranked matches attached to leaderboards, in light of the entire Battlegrounds mode, seem completely redundant. Forts mode, which isn't playable in Battlegrounds, then gets shunted as players shift over. Currently, the highest rated Forts player on the leaderboards has 57 points. The eight ranked player has 10 points. Of course, beyond all that troublesome match variety, it's worth repeating that the 'Worms' multiplayer experience remains largely intact. Of the new weapons, the teleport gun, which zaps your worm into whatever wall you hit and can be used over and over again until the worm lands on the ground, is the new ninja rope and thus a wonderful favorite of mine. Drowning worms is sadistic fun. The classes are interesting to screw around with, their differences enhanced (the soldier can blow grenades with the tap of a button, the heavy guy does more damage and makes a huge explosion upon death, etc. ), though it's clear a lot of player are leaning towards the two mentioned. The scout doesn't really offset his lowered damage output with faster movement, and the scientist's stronger emplacements aren't even remotely appealing. The issue is that an upolished installment so far along in the franchise's life only feels like a disappointment; a rush job for the new consoles. What was once a clean, bespoke look had devolved into a jarringly jagged mess in 'Worms Revolution,' but that was forgivable because Team 17 was making strides in the gameplay department while (nobly) maintaining a small team. Without any game-changers this time around, and with the same look, that feelings of disappointment set in, especially when Xbox One and PS4 are on the box art. Once you drudge through the campaign, realizing a massive chunk of their time was spent on niche one-liners, a bogus story and generally uninteresting missions, it feels like 'Worms' is desperate to feel antiquated. The tiny scouts disappear into the poorly rendered landscapes, most of the interactive objects on-stage lack enough definition to communicate its effect or purpose, and though the water is effecting in combat, there's nothing water-like about the way it looks or moves. Most jarring are the multi-layered backgrounds, which needlessly complicate the judging of worm placement and weapon aiming. Multiple times, at the beginning of the match, I'd place my worm and watch him fall one hundred feet, losing thirty or so health and putting me at a disadvantage, but that may just be my problem. The presentation generally worsens outside of the game, with clunky menus and rashly considered theming. Mostly I'm of the camp that sets aside bad visuals five minutes into a game, but 'Worms Battlegrounds' just never shakes the mud off, which sadly makes me wonder where the franchise might be in someone else's hands. I'm actually a bit enamored with the small range of tunes scattered throughout this game, which each seem equally passive as they are encouraging in their own way. Even the menu music evokes an odd playfulness (perhaps it's the xylophone), while the 'Battlegrounds' theme drums up the war banners inside and gets you in a fighting mood. 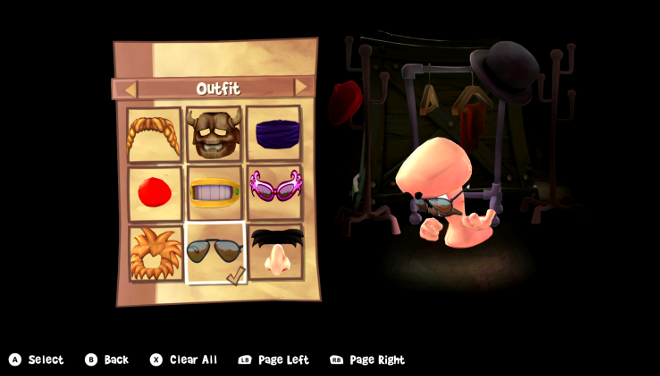 The wide speech banks, a 'Worms' tradition, livens up your little buddies in whatever way you can, begging the player to explore every other customization option in tandem. The only real downside to the audio is, again, the narration, which has no need for existing and makes no justification in execution. As a game that exploded in popularity due to its multiplayer, 'Worms' remains delightfully replayable, but I have to mark this section a bit down for the sheer hastle of finding a solid game online. 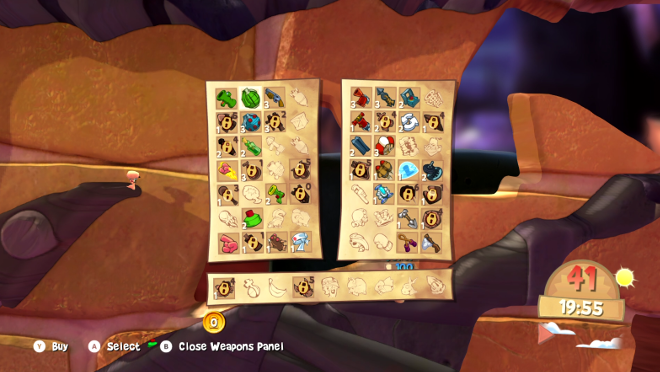 I'm especially peeved at the neglect Forts has received, as that mode was the thing that kept me coming back to 'Worms 2: Armageddon' on the Xbox 360. The very thought of navigating the online infrastructure is discouraging. The one-note single-player stuff doesn't help either. A map editor and achievements and trophies round out the package.